Shrove Tuesday, or Pancake Day as we call it in our house, is quite possibly one of my favourite days in the calendar year. Not because I’m religious, but because I see this day as a legitimate reason to eat pancakes at every meal and every opportunity. So with that in mind, today’s post is for two pancake recipes. And instead of the normal lemon and sugar or Nutella filling suggestions, I’ve created a pancake cake – one savoury and one sweet. And believe it or not, whilst both were tasty, my favourite was the savoury one! The pancakes in this recipe are what the French call crepes – very thin, as opposed to the pancakes Americans have for breakfast. Sift the flour into a bowl. Make a well in the middle and pour in the milk and lightly beaten eggs. Unless you’re Popeye, I’d recommend using an electric hand whisk or stand mixer and combine the flour and eggs and milk until you have a super smooth batter. Lumps are not welcome! Using a 7″ non-stick frying pan, add a splash of oil and once it’s reached smoking point, pour the oil out. Add a ladleful of batter to the pan (about 2 tablespoons), tilting the pan to swirl the batter so it evenly covers the pan. Cook for 2 to 3 minutes each side. Set aside and repeat the process, putting a sheet of greaseproof paper between each pancake whilst you continue making the others. Continue until you’ve used all the batter. Remove a handful of the cheeses and set aside. Put the remaining grated Gruyere and Emmenthal cheeses into a bowl and mix in the cornflour. Pour the wine into a large saucepan and bring to the boil. Simmer for 1 to 2 minutes. Add in the chicken stock and the Gruyere and Parmesan cheeses and whisk. It should form a gooey, stringy mixture. Whilst the cheese sauce is simmering away, put the unsalted butter into a frying pan and melt. Once melted, add in the mushrooms and fry until softened and are starting to colour. Put a piece of kitchen towel onto a plate and place the mushrooms on top and dab to remove any excess butter. Then mix the mushrooms into the cheese sauce. 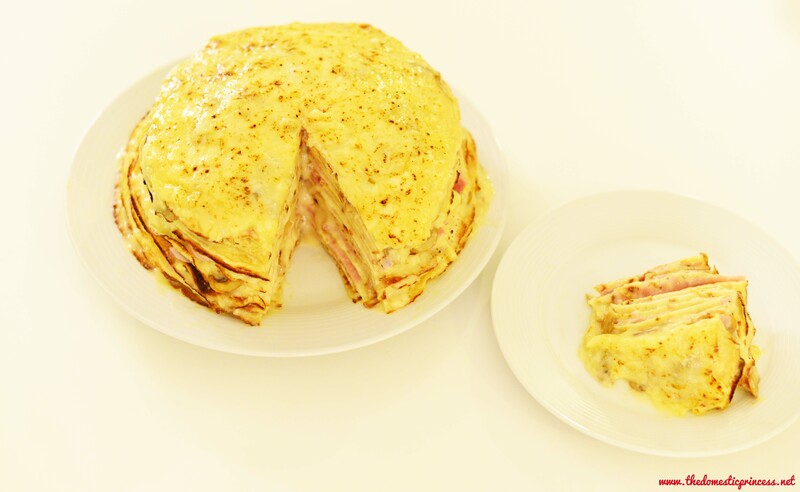 To build your cake, put a pancake onto a serving plate or board, then spread some of the cheese and mushroom sauce, pop some of your ham slices on top (2 slices seemed about the right amount for mine). Keep doing this until you have a small amount of the sauce left (I used 15 pancakes). On the top pancake, spread the rest of the sauce and sprinkle the remaining grated Gruyere and Emmenthal on top and pop in the oven for around 15 minutes until the cheese on top is golden brown. Put the chopped chocolate all in one bowl and set aside. Pour 400ml of the cream into a saucepan over a low heat and bring to the boil. Once the cream just about hits boiling point, pour over the chocolate and whisk until the chocolate is melted and the mixture is smooth. Mix in the Grand Marnier or Cointreau and orange extract. Put into the fridge for 30 minutes. Just before you’re ready to assemble your cake, whip up the rest of the cream until it forms soft peaks. Place one of the pancakes onto your serving plate and spread some of the chocolate orange mixture on top. Then spread a thin layer of cream. Repeat the process until you have a tower of pancakes. 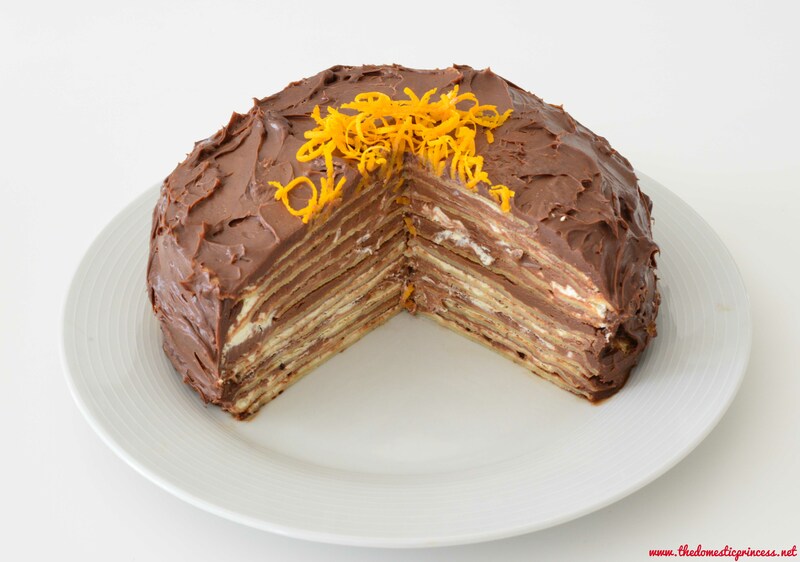 Use the rest of the chocolate orange ganache to frost the cake. Sprinkle the grated orange zest on top. Put in the fridge for at least an hour to set. If the thought of making all these crepes is just too much to think about, then cheat and buy some ready-made ones. Your batter should be quite runny, like the consistency of single cream. If it’s not, add a drop more milk to it. I know some recipes say to use butter to grease the frying pan ahead of cooking the pancake, but may I suggest you to stick with oil? Butter has a tendency to burn and will give your pancakes a burnt taste. Make sure that once you’ve heated the oil up in the pan, you make sure all of it is poured back out, otherwise you’ll be deep frying your pancakes. Don’t be surprised if you throw away the first one or two that you make. There’s no science behind this, but every single time, without fail, my first two pancakes are a total disaster! Pancake batter can be made two to three days in advance and stored in the fridge. Cooked, cooled and snuggly wrapped, you can store pancakes in the fridge for around 5 days or up to two months in the freezer. I know both of these cakes are quite unusual, but I can assure you, you won’t be disappointed. Not in the slightest. The Domestic Prince is all kinds of awesome in many, many ways. Breakfast in bed on a Sunday morning? Check. Supportive? Check. Kind? Check. Loving? Check. Indulging me in my love of all things sparkly? Check. Good memory? Hhhmmm not so much….. I think I might lose the plot if he asks me one more time what his PayPal logon is! So in an attempt to help him, and in turn help save me from sounding like a broken record, today’s post is slightly selfish. Email, online banking, Facebook, Twitter, YouTube, Instagram, online shopping, the list goes on. Nearly everything that you do these days requires a password. I’m sure you’d all agree that it’s quite annoying to create accounts, as well as coming up with and remembering new passwords for all of them. Some require capitals, some have a minimum character length, some need numbers and then there’s those that require a character such as @ or *. The good news, is that there are handy little apps out there to make your online life a tiny bit easier. What are these apps, I hear you ask. They’re called password managers. A password manager will save you a headache or two by remembering your countless passwords, freeing you up to remember the more important things. Some also have the capability to remember email addresses, ATM pin numbers, credit card information, usernames etc, all securely and safely. All information is stored in an encrypted file that protects the confidential data from anybody who might have physical access to your mobile device. The encrypted file can only be accessed via a master password – which is a complete result, as you now only have to remember one password as opposed to many. Some password managers also have the potential to generate unique and complicated passwords that make it extremely difficult for those trixie people to hack into. Below are the five password manager apps on my shortlist to deploy in the Domestic household. I’ll come back and let you know which one we choose. This app keeps your many online passwords safely locked up. It can also keep track of other data like passport details, addresses and more. The app is quite plain, which will make using it a cinch, even for the most technologically challenged. 1Password can also generate strong passwords. Simply enter the master password to unlock the 1Password app and access websites with one single tap. 1Password also stores credit cards, passports, bank accounts, driver’s licenses and more; ensuring all your important data is always with you. And obviously, all data is encrypted, so if you’re unlucky enough to lose your mobile device, or to have it stolen, all your personal data is completely secure. 1Password is also available via Mac and Windows desktops as well. LastPass stores web site passwords, credit card information and more. All behind a master password. It’s also designed with simplicity in mind: there are no complex menus here. LastPass also offers a comprehensive overview and analysis of the security of your existing passwords. It looks at things like the length of the password, how many times it’s been reused across different websites and then gives you a global ranking and percentage score for your passwords. All information stored on LastPass is encrypted locally, so your information is always safe. Like 1Password, LastPass is available on Windows or Mac computers as well as an app. Like LastPass, oneSafe lets you save and encrypt photos and entire documents together with credit card numbers and passwords for your online life. Everything is protected either by a PIN, a password or pattern-tracing access. You can also set the app up to alert you to any attempted break-ins. oneSafe also allows information to be synced between devices that use iCloud. It’s available as a desktop version on the Mac, but not yet on Windows. Dashlane automatically syncs across multiple platforms, allowing for seamless interaction. All versions of Dashlane include alerts on security breaches, a built-in digital wallet for online purchases and automatic saves and screenshots of any purchases. Being an avid online shopper(!) one of the features that really appeals to me is how this app facilitates online shopping through very easy to use colour-coded information. Purchases are completed in a matter of a few clicks! (Not sure the Domestic Prince will be loving this feature!). As well as keeping all your passwords safe, Dashlane also stores driving licences, bank cards and pretty much everything else you want kept away from nosey parkers! If you choose to purchase the desktop version, it’ll tell you how many saved passwords you already have in your browser and give you the choice to review and encrypt them. Like some of the other password managers, mSecure is available via multi devices and various platforms. It allows you to store passwords and other sensitive data according to different categories – ranging from passport data to credit card numbers and clothing size. It also lets you create your own categories too. Access is via a master password and for the super cautious among you, one can specify the data stored to be erased after either 5, 10 or 20 failed attempts at getting into the app. If you’re after a pretty looking app, then mSecure isn’t for you. If simplicity and a no-frills app is your priority, then mSecure would be a good choice. All of the apps bar mSecure, which will set you back £6.99 are free, with in-app options to get further functionality. So there you go, 5 password managers that can take care of keeping your passwords and other personal data away from prying eyes. Do you already use a password manager to store your passwords? If so, which one do you use?